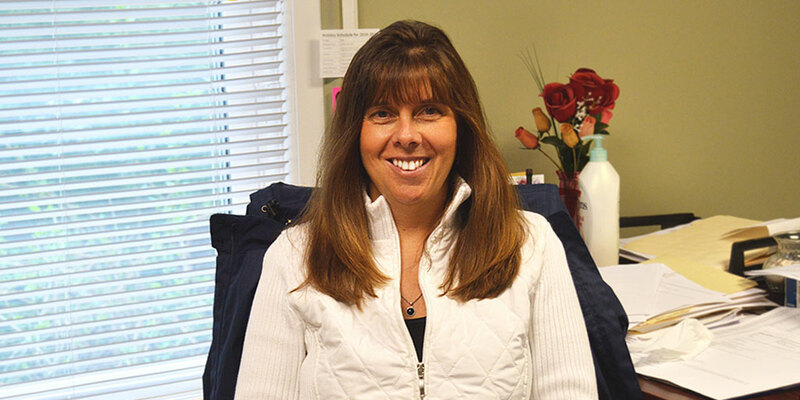 Lisa Baker is the administrative assistant/office manager for Campus Services at Cazenovia College. She makes student and staff IDs, provides keys for both, issues parking permits, and oversees the College's transportation system. It is never a dull moment in the Campus Services office. There are always students coming and going, which is something Baker enjoys about the job. She explains, "I have students who visit me daily, which is nice, but also hard because they always leave after four years." When Baker is not working she enjoys being outside skiing, golfing, camping, and going on walks with their new adopted dog Leo from Helping Hounds. Baker explains, "I live a very simple life." She also enjoys making dinner for her family, and hanging out with friends. Her son graduated from Utica College in 2016 and made the Dean’s List. She is very proud of her son and what he has accomplished so far in his life. Baker also has a cat named Hunter, who she enjoys relaxing with. She loves being on the beach in Florida and hopes to retire there someday with her husband. When Baker was younger, she wanted to be a kindergarten teacher. Although she did not become a teacher, she still helped in her son's kindergarten class as a parent helper. In her role at Cazenovia, Baker still gets to work with students. Baker explains, "It still relates to students, they are just a little bit older." Baker shares, "I have worked a lot of places and this is definitely the best place I have been employed. With the college being a small community, it is like a family away from home." She also hopes that she has made an impact on students, just as they have on her. Stop by to see Baker anytime, she is open for visitors.